When viewing an asset you’ll see a box at the bottom for commenting. Comments left here will be associated with the asset’s current revision file. If there are previous revisions for the asset, you’ll see a revision history above the asset's activity feed. Select a previous revision and you’ll see any existing comments for it, as well as other activity, under This revision. You can also toggle Comments only instead of all activity for the revision. All activity will show all the actions taken on all of the asset's revisions. You'll see comments in the activity feed on Home, as well. More on Home screen and activity feed. 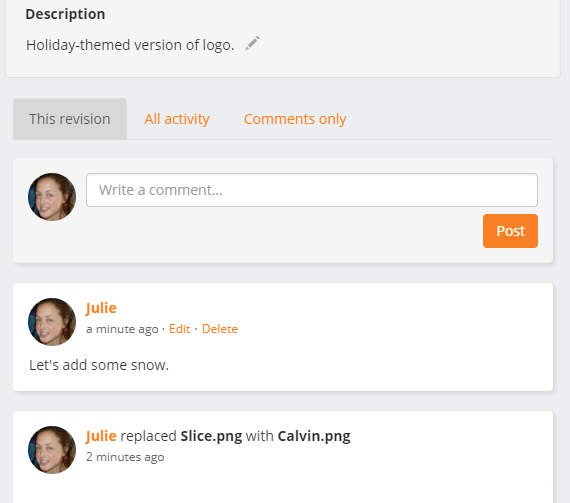 Users can edit or delete their own comments and Team Owners can edit or delete comments left by any user.